If you’ve traded stocks, you’re probably familiar with all the indices available such as the Dow Jones Industrial Average (DJIA), NASDAQ Composite Index, Russell 2000, S&P 500, Wilshire 5000, and the Nimbus 2001. Oh wait, that last one is actually Harry Potter’s broomstick. Well if U.S. stocks have an index, the U.S. dollar can’t be outdone. For currency traders, we have the U.S. Dollar Index (USDX). Okay before you fall asleep after that super geeky definition, let’s break it down. It’s very similar to how the stock indices work in that it provides a general indication of the value of a basket of securities. Of course, the “securities” we’re talking about here are other major world currencies. If you answered “24”, you’re a genius! 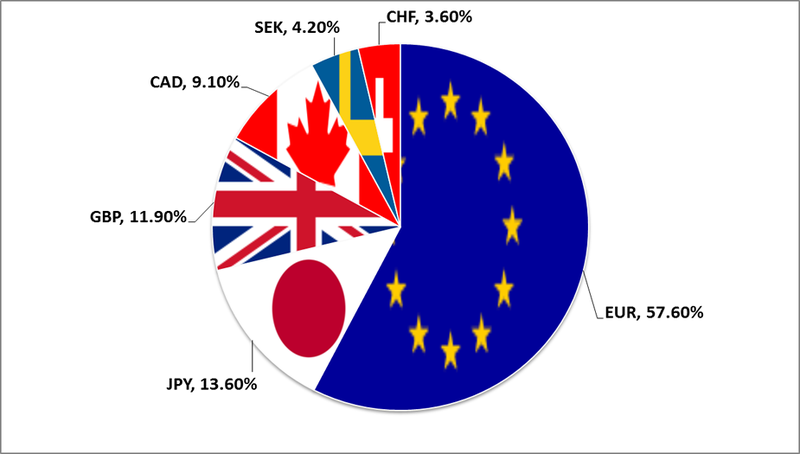 There are 24 countries total, because there are 19 members of the European Union that have adopted the euro as their sole currency, plus the other five countries (Japan, Great Britain, Canada, Sweden, and Switzerland) and their accompanying currencies. It’s obvious that 24 countries make up a small portion of the world but many other currencies follow the U.S. Dollar index very closely. This makes the USDX a pretty good tool for measuring the U.S. dollar’s global strength. USDX can be traded as a futures contract (DX) on the Intercontinental Exchange (ICE). It is also available in exchange-traded funds (ETFs), contracts for difference (CFDs) and options. Now that we know what the basket of currencies is composed of, let’s get back to that “geometric weighted average” part. With its 19 countries, euros make up a big chunk of the U.S. Dollar Index. The next highest is the Japanese yen, which would make sense since Japan has one of the biggest economies in the world. The other four make up less than 30 percent of the USDX. The other four make up less than 30 percent of the USDX. Here’s a question: When the euro falls, which way does the U.S. Dollar Index move? The euro makes up such a huge portion of the U.S. Dollar Index, we might as well call this index the “Anti-Euro Index“. Because the USDX is so heavily influenced by the euro, people have looked for a more “balanced” dollar index. More on that later though. First, let’s go to the charts!